Weathermax is just such a cloth, but it's a pity that it doesn't sew very well. My winter project with weathermax 80 turned out well. I had two 5-6 meter long seams running "aganist the grain" right down the middle of my new top two panels so I definitely did not want lots of pucker along the seam. These seams are "along the roll" which is the worst direction for puckering. See close-up and full size pics of finished panels. As described in Reply # 6941435 on 6685408 my only method change was to coated the 1 inch seam offset with hardware store contact cement. Abrasion resistance is certainly an important factor, particularly for long distance sailing. Equally important is the ability to withstand repeated diagonal loadings without breaking down. We've seen that happening in cloths that have a loose weave and a high proportion of filler. There isn't an indicator for that in the table, unless it's the denier of the base fabric - Odyssey: 300, Top Gun 9: 450, Top Notch 9: 600. The heavy weight Top Gun has a denier of 600, and we know that to be a good performer, so maybe there's a clue here. Maybe Top Gun 9 has a good balance between these two properties. 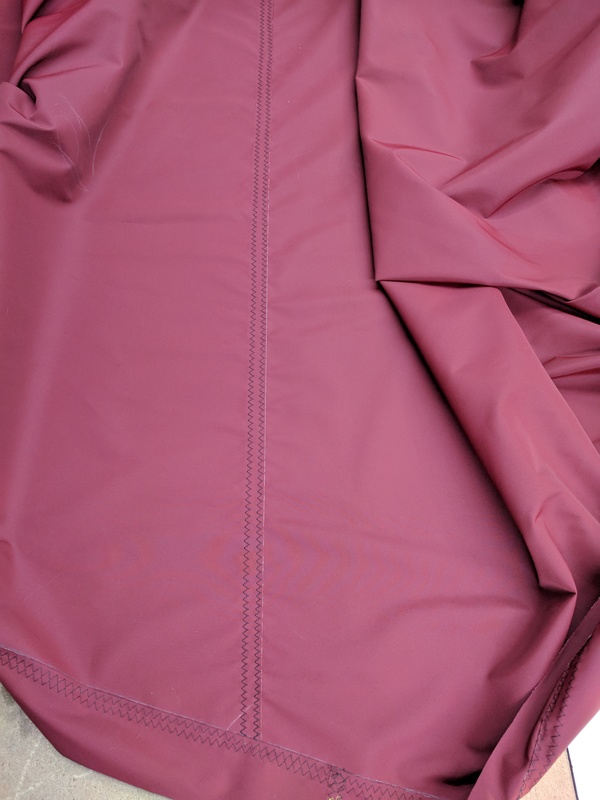 Conventional polyester sailcloth is very tightly woven with little filler, so that its performance in a biassed pull is very good; but that tight weave also means that it is very rigid, and we do like a cloth that is soft enough to furl down neatly without trouble. I think that we're looking for a polyester cloth that is soft, yet tightly woven, and with little filler. Weathermax is just such a cloth, but it's a pity that it doesn't sew very well. 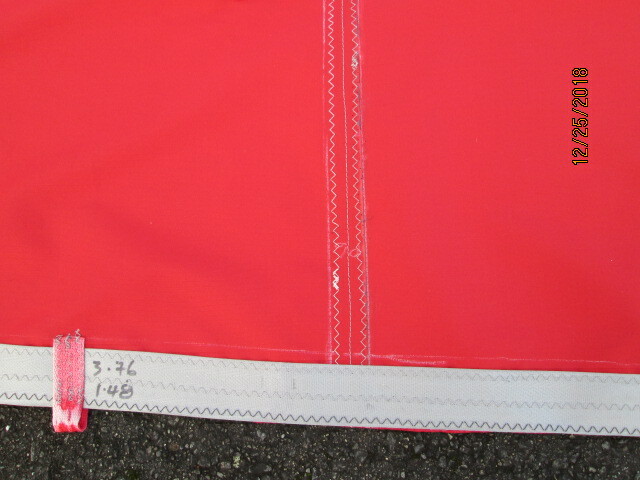 The Clipper Canvas of Weaverbird's current sail is the nearest to ideal that I've used, but is difficult to find. The Haywards Sunwing 5.5oz sailcloth that I've used for most of the new wingsail is going to be a bit stiff and crackly for comfort, until it settles down and softens up, I fear. 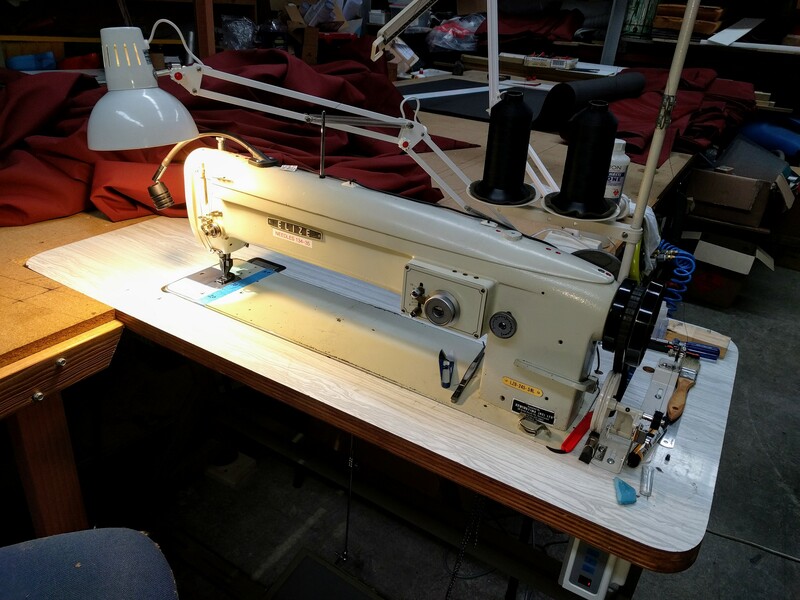 Is there any up to date user info on sewing Top Notch 9 and its performance in service? I'm strongly in favour of Top Gun 9 (which is the old Mustang). 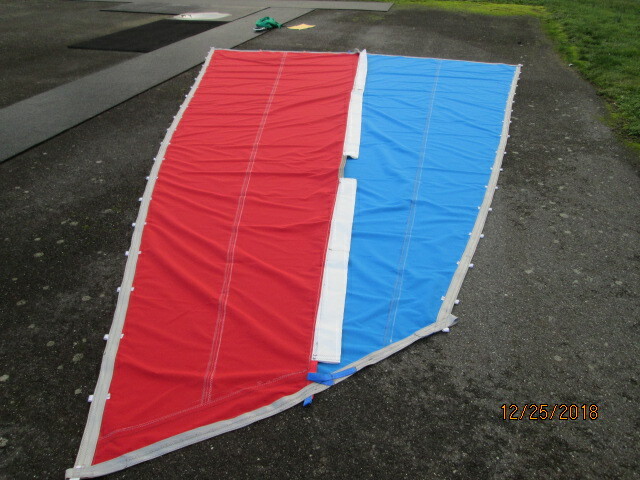 After having made four sails from Weathermax 80 (ranging from 100 Sq.Ft. to 650 Sq.Ft), I don't like it and will be using Top Gun 9 when I make the sails for LCB. I used Mustang for LC's sails and after six years of regular use and never a sailcover down here in New Zealand, I'm very comfortable with it. It also showed no signs of chaff where the sail is trapped between the mast and battens. The sails look the same as the day I first put them on. It is also very, very much easier to work with than Weathermax 80 and it does not need to be cut with a hot knife. In one of the threads, there were a few comments on Top Notch 9 perhaps being a good choice. Looking at the specs vs Top Gun 9, I'm surprised at the difference in abrasion resistance: 10,000 cycles vs 600 cycles with Top Gun the clear winner. Should this be a deciding factor? That's weird about Outguard. My yellow Outguard has colour on both sides. Today we received the Swela Outguard 393 190g (burgundy). Unfortunately it's just colored on one side. This is maybe a valuable information. The data sheet suggested something different IMHO. But fortune favours fools, the seller will take it back. Thought I'd post a photo of pucker in a sail currently under construction. The top most panel in the foresail for Roger Fullerton's Feng Zheng. 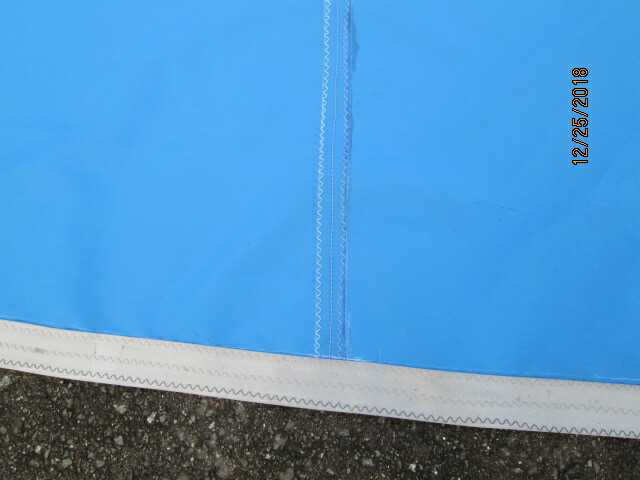 BTW: This particular seam was sewn on the Sailrite LZ1. The Elize gets rather less pucker but I did not yet have it when I did this panel. See pic. Contact cement, the everyday hardware store stuff, brand is weldwood in the US does make a visual difference to weathermax 80 puckering. The fabric absorbs the stuff so had to put on 2 coats to feel the tackyness. Seam is 1 inch wide. Each "panel" is 13 x 49 cm. The non-cement panel have only 1/4" 2-sided tape (usual for Odyssey). Using Paul T.'s identifiers. I'll be trying 1-inch 2-sided tape...it may produce the same result without the volatiles. However, it may be the "soaking in" that minimizes the yarn displacement effect. 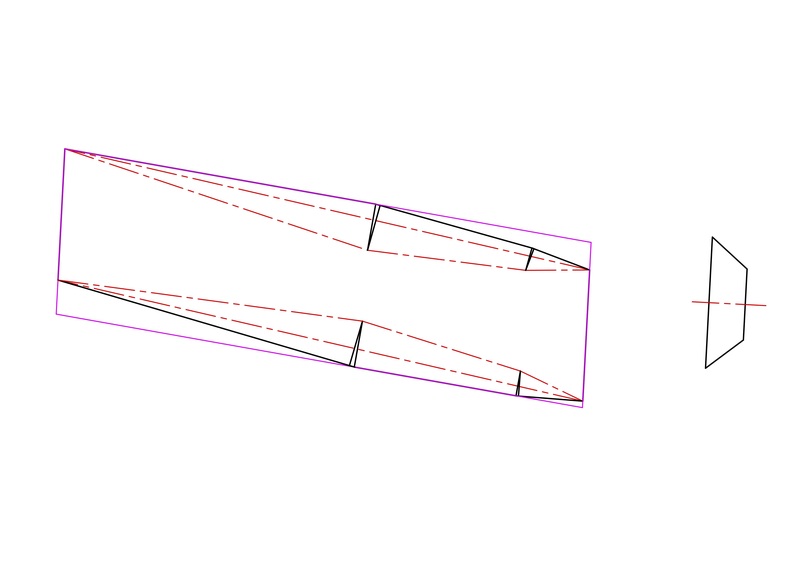 This subject got me thinking about how, hypothetically, I'd set about making SibLim's sail. It doesn’t seem to be a very good plan to think of shelves, as that seam would be along the warp. Vertical cloths in the panels are also out for the same reason, so broadseam is out. I come back to tucks as being the way to do it, with the least sewing within the panels and that sewing being along the weft, and with seams along the battens only, where the puckering can be pulled out easily, or simply ignored. I’ve had a quick look at the drawing again, and there doesn’t appear to be much adjustment needed to make this feasible. 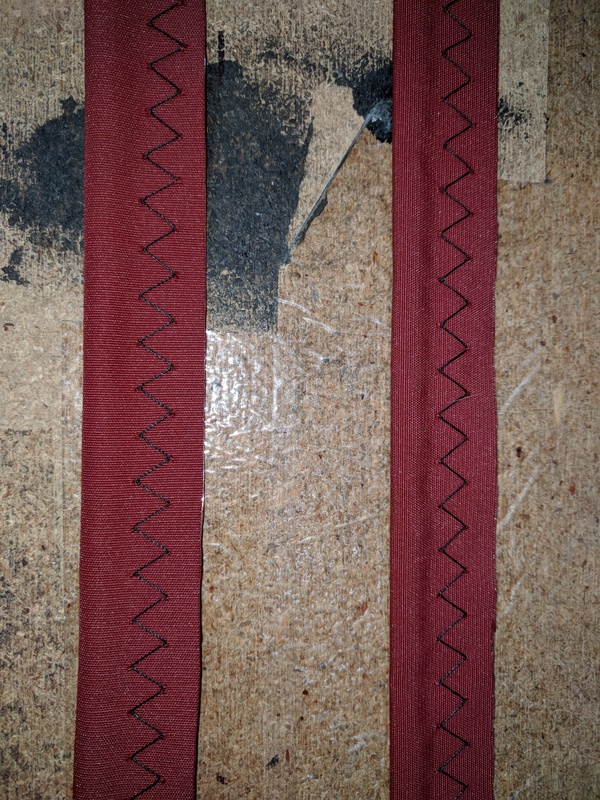 The lower three panels will come out of single cloths as they are, and the upper three panels just need slight adjustments to their leech lengths. In the accompanying image of the shape of the lower three panels, the cloth is magenta, the panel cut from it is black. In case you have a bit leftover from that Weathermax cloth, what about measuring up a strip of exactly 1m x 50mm? 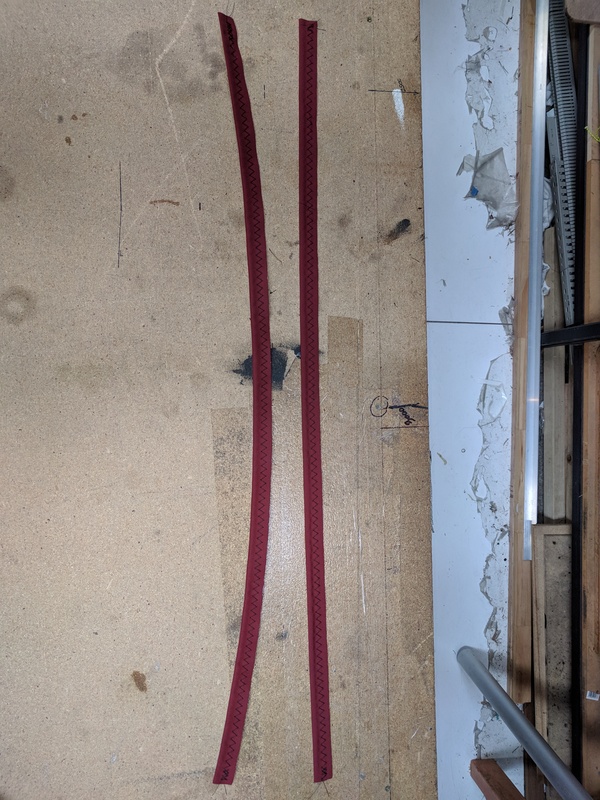 If you then wrap this (lengthwise) and run a seam along it, how long is the test strip after sewing? Arne, here are my samples. Both 1M x 50mm bent over once. Left example is along the roll and it's where the pucker occurs. After sewing the piece was 92mm long giving me 8% shrinkage. It was easily stretched to 1M but always pulled back to 92mm. 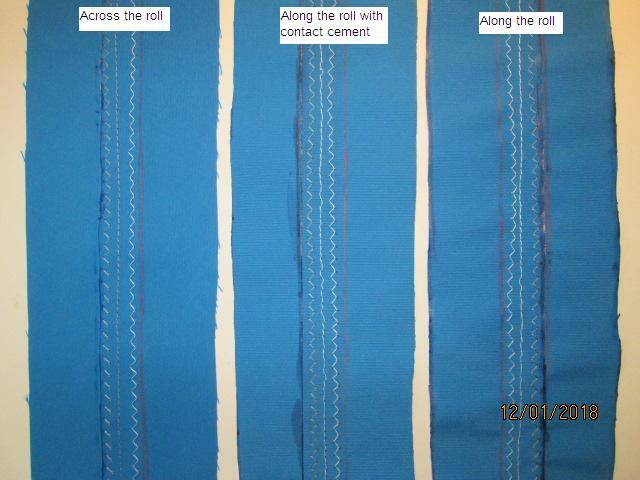 Right example was across the roll and after sewing was 99mm giving 1% shrinkage. The pucker is minimal once you are sewing more than two layers. Machine: Elize LZ9-245-5NL top & bottom feed walking foot machine. Update, I thought I'd check out the the along role pucker but this time with basting tape. It does help reduce pucker... found it to be reduced to 4% on my machine.